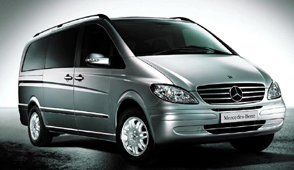 Comfort and space on the move… Our Mercedes V class (Viano) People Carriers are the ideal choice for our chauffeur clients requiring additional space when on the move. The versatile seating arrangements can accommodate up to seven passengers, together with luggage. Large rear tailgate and sliding side doors enable the easy access for awkward or bulky items. Surfboards, snowboards, skis or pushchairs, for example, are consumed with ease within the People Carrier’s roomy interior. The ultimate business chauffeur vehicle...The V class (Viano) is also much appreciated by our business clients – when conducting corporate roadshows for instance. With ample space to comfortably use a laptop, spread out paperwork or even conduct a business meeting around the integral table, the V class (Viano) assures immense practicality, but retains all the usual refinements expected of a Mercedes Benz vehicle. Equally at home on the streets of a busy commercial centre or cruising long distance, the V class (Viano) never fails to deliver.Flexible chauffeur hire…Whatever your requirements – from a long-distance airport transfer to a VIP movie premiere, ourLondon chauffeur fleet has the versatility and flexibility to cater to the most demanding of itineraries. Contact Le Tour today to discuss your requirements. Le Tour also offers the definitive in luxury road travel with our Maybach and Pullman limousines. London Airport Transfer And Executive Chauffeur HireA Gatwick airport transfer using high quality Le Tour executive chauffeur hire ensures that you reach your destination on time, in comfort, and in style. Chauffeur driven London limousines range from the reliable and comfortable Mercedes Benz E Class, which is perfect for any budget, to the ultra luxurious and even opulent Rolls Royce Phantom, providing total relaxation and comfort. Whichever of the high quality chauffeur driven limousines you choose, you always benefit from the services of our friendly London chauffeurs with extensive knowledge of the local area.Gatwick Airport Transfer ServicesAs the 2nd busiest airport in London, airport transfer services from Gatwick are commonplace. Visitors looking for Gatwick airport transfers include businessmen attending important conventions and meetings, as well as holidaymakers and families that want to relax and unwind after a potentially stressful and long flight. With Le Tour London airport transfer all customers enjoy the same high level of service from professional chauffeurs and in well kept luxury London limousines. With a professional Gatwick chauffeur, transfer from airport to hotel can be simple and stress free. Your driver will be waiting to help you and your luggage to the limousine that you booked and excellent local knowledge helps ensure that you arrive at your destination having taken the most direct and traffic free route. Your chauffeur will monitor flight times so that they can arrive in plenty of time and will also let you know of any delays on the return journey. Le Tour Gatwick chauffeur transfer services are designed to make your transfer as easy as possible. Le Tour London executive chauffeur hire is proud to boast a fleet of high quality, professionally maintained and well cared for executive limousines. Choosing the right car for your budget, your needs, and your preference will further help ensure that your London airport transfer is as enjoyable as possible. A selection of Mercedes Benz cars make up the mainstay of our fleet including the E Class and S Class as well as the much larger Viano. The S Class Pullman is something a little extra special, and if you want the full works then the Rolls Royce Phantom, Bentley Arnage, or Bentley Continental Flying Spur are excellent choices. Le Tour London airport transfer services are an ideal way to end this leg of your journey. Following delayed flights and cramped aeroplane conditions, as well as the rigours of passport control you’ll undoubtedly want to enjoy some peace and relaxation without having to worry about whether your taxi driver is taking the best route. Contact us today to discuss your airport transfer needs or to receive a competitively priced no obligation quote. Flying may be the most convenient form of travel but it is far from being a stress free and simple solution. Long waiting times in the airport, frequent delays, and regular hold ups while getting through passport control are just some of the problems often associated with flying. Unfortunately, once you land, the difficulties aren’t necessarily over. Finding a reliable and high quality Gatwick chauffer transfer service can be a difficult task in itself. Shuttles, taxis, and buses are far from being reliable or convenient and following a difficult flight or at unsociable hours it can seem even more difficult to find just the right service. Fortunately, all Le Tour London airport transfer services enjoy the same high quality of executive chauffeur hire and exceptional limousine hire. Our hand selected chauffeurs are picked for their combination of friendly and professional nature, excellent driving skills, and extensive local knowledge. Armed with this set of skills our Gatwick chauffeur transfers run like clockwork so you not only enjoy a stress free transfer but start your trip to London with a comfortable, luxurious, and high quality service. Le Tour executive chauffeur hire is designed to make your life as simple and enjoyable as possible. Your Gatwick chauffeur transfer will ensure that they are at the airport or hotel in plenty of time and will monitor your flights so that they know whether you will be on time or if your flight is delayed. They will check traffic news and discover any potential hazards or road works that may render a particular route useless and they will act accordingly. When your flight arrives you will be greeted from the airport, have your baggage taken to your luxury limousine and be chauffeured to your hotel. The fleet of executive chauffeur hire limousines we offer is also of a very high standard and every prestige limousine has been chosen for its luxurious interior and beautiful looking exterior. From the comfortable and convenient Mercedes Benz Viano to the more extravagant and ultimately luxurious Rolls Royce Phantom we are confident that we have just the right limousine for your Gatwick chauffeur transfer requirements. Please check our list of London airport transfer limousines to see the excellent rage of luxury London vehicles we offer. If you have any questions regarding the Le Tour executive chauffeur hire service, or you wish to book now for a Gatwick chauffeur transfer then call us or get a quote using our simple and secure online quote request form. We can usually tailor our services to meet your exact requirements and a friendly member of staff is always on hand to answer any questions or queries you might have. Visit our Limousine page for further information. Heathrow: £90 out £95 in. Hourly rate: £35 per hour, includes 10 miles per hour. Extras: Each additional mile is charged at: £1.50 per mile. Get a more detailed quote.